Some of the newer Garmin devices have a cool feature that predicts your time for certain races. I have been looking at this metric on an off for the last 8 months but with increasing frequency as I get closer to my upcoming marathon. I also found an interesting thread on Reddit about the topic. At this point the watch has a lot of my recent running data so it should be fairly “tuned” in to me. I would love to think I could run a 3:27 but I think that may bit faster than I can pull off. Although, it has me thinking, if I am feeling good maybe I shouldn’t slow my pace too much! 3 more sleeps until race day! A: 3:42 or faster, I think this gets me the cushion I need (3 min) to get into Boston. B: 3:45-3:43, This gets me a BQ but not a mostly-guaranteed spot. C: >3:45, this gets me nothing but a marathon finish, which is something in itself! Race Ready? I think so! My marathon training in the past has been very different. Usually it was 16 weeks with several longs runs throughout. My coach Jen, takes a different approach to training for a marathon especially since we are balancing triathlon training on top of it! The big difference is I don’t run as much as I used to. For some this might be a bit unsettling but Jen hasn’t steered me wrong in the last three years so I am sure she has this figured out! I recently had two chance test my fitness. I did the Wings for Life World Run where I tried to run my goal marathon pace (8:27) for the race. Nailed it! Then yesterday I needed to run 2:30 hours at zone 1/2 heart rate. I picked a loop to run that was a change of scenery for me but allowed me to circle back to my car for supplies if needed. My goal was to run at least 9:30 or faster but really pay attention to how I felt and keep it easy. At the end of the run I was supposed to be able to keep going if needed. Nailed it again! I managed 17 miles in 2:32:07, average pace of 8:57. And yes, I totally could have kept running! So I have entered a bit of a taper until the race on May 29. I am doing my best to not mess anything up and just keep following my training. I am working to eat well so I can show up to the race at a good-for-me weight. I am making sure to stretch and keep my body happy. And I am doing a lot of positive self talk. It is going to get dark on race day around mile 18; but I know I can push through. I have done it before. On race day it will be time to trust the training and believe in myself. 3:43 or bust!!! A couple weeks ago I did a number on my back. I didn’t have much time to fix it because I have an upcoming marathon that I am hoping to qualify for Boston at. So I made a call to a fellow athlete since I knew she had a guy. Enter Dr. Chris at Complete Performance Center. After checking me out we did some treatment for the next 2 1/2 weeks. Treatment included stim, stretching, and a couple of adjustments. By my second visit I was already feeling better! Now I am happy to say, my back is better and the stretches he gave me a doing wonders for me! Look at the data from my last two Yasso 800 runs. These 800s were all run in the same place. Only real difference was a headwind for the run back. I was faster this week. Not a ton faster, but I will take any improvement I can get. Also, after the Wings for Life Run last weekend I got a notification from Training Peaks that my threshold run pace had gone down 2 seconds to 8:10. Once again, not a huge improvement but considering I wasn’t running at max effort and actually had a very reasonable HR this is great news! So this has me VERY hopeful of running my goal marathon of 3:43 in two weeks. That is a pace close to 8:27 per mile. One more week to put a bit more hay in the barn and then I get to burn it down! Motto right now is fear the training, not the race! I overdid it two weekends ago while volunteering at a track meet. I helped carry a double pop-up tent a fairly long way. I was fine that day but as the week wore on my lower back got worse and worse. By Thursday I struggled to get out of bed. Once I am up and moving I feel better but getting up and down is a problem. It is really just a nasty scrape and a couple of bruises. What I am struggling with is how much rest do I take to let the back heal up and how much of an impact will it have on the marathon that is less than 4 weeks away? 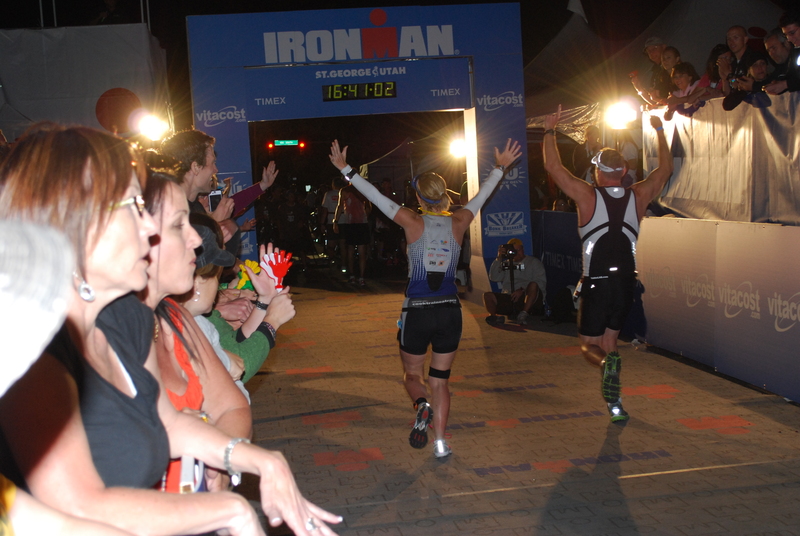 Shooting for a BQ wasn’t even on the radar before Oceanside 70.3. But now I see this marathon as my only chance for this year; and I really want to do it. A bit of doubt has crept into my head. I think if I can be running again by tomorrow/Wednesday I still have a chance. I am not ready to throw in the towel but I don’t want to make a bad decision over one race.